One of the hallmarks of MJB is its mixture of veteran and younger researchers, creating a collaborative research environment that blends the Institute’s knowledge and experience with new perspectives on the issues. Over the past weeks, the “younger” demographic was given a boost by the presence of Suzy Landon, a Newton, Massachusetts, native, who served as a research intern at the Smokler Center for Health Policy Research. Landon, a graduate of the University of Pennsylvania’s Health and Societies program and the London School of Hygiene and Tropical Medicine’s Public Health program, came to the Smokler Center to learn more about health care policy research in Israel. “I have known for a long time that I wanted to be a pediatrician, but I also am very interested in health services research,” Landon explained. 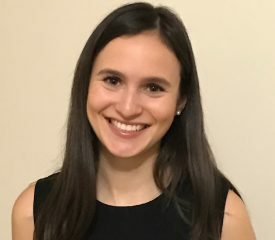 In her internship, Landon worked closely with Yael Ashkenazi, head of the Smokler Center’s Health and Society Team, on a secondary analysis of data from Ashkenazi’s study of a Ministry of Health program to encourage young physicians to work in the periphery and enter underrepresented medical specialties. During her stay at Brookdale, Landon also presented her Masters’ work on how health system factors contribute to international variation in cancer survival in high-income countries. Following her stay at MJB, Landon will remain in Israel through the spring as a volunteer with Magen David Adom in Israel as part of a Career Israel program. Upon her return to the United States, she will begin her medical studies.